There is a happy ending that covers all the joy, but the greater focus was on the not so fun parts that come before that. Not that it was a dark movie. It was just closer to the truth than I actually expected it to be, while still being light enough to not be entirely depressing. I see a lot of negative reviews, and while I disagree with what they say, I think I understand the negativity. 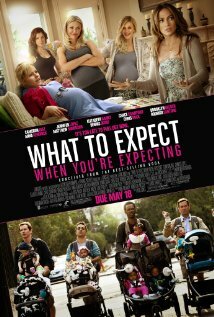 At the end of the film, I concluded that this was a movie that was meant for people who already have children, aren't overly sensitive about trying to have children, and maybe even people who don't want children. It's not a romantic date movie. My husband and I really liked it, but we fit into the 'already have kids' category, so, while the darker truths brought us to tears, we could handle it, having already been there done that, unlike when I watched Knocked Up while pregnant and had to run out of the room during a certain scene. I give the movie a higher rating for being this honest, but I just can't recommend it to everyone.